I’d consider myself a pretty stellar shopper. Considering I’ve been practicing the art of shopping all my life, I can almost always attain what I’m set out to find. However, when it comes to shopping for mom, well, it’s an entirely different story. I’m not sure about yours, but my beloved mom is just about content with everything she’s got in life (which is awesome) but makes it quite difficult when trying to find a gift for her. 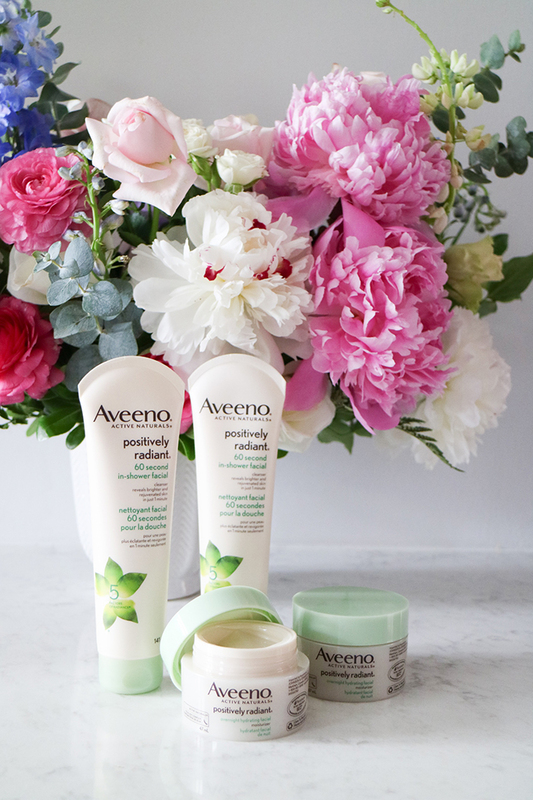 This Mother’s Day, I am determined to find a unique gift that my mom (and yours) will have major appreciation for. Inspired by my recent visit to the One of a Kind Spring Show, I discovered some fantastic, hand made gifts that every mom will swoon over. If you ask any of my colleagues, family or friends, I’m always the one that’s cold at the office or at home. Regardless of time of year, I’m convinced that I’ve physically been wired to be a few degrees cooler than everyone else! At the office, you will often find a huge scarf draped over my shoulders, and at home, I’m always the one snuggled up with a giant faux fur throw. The winter weather has really made its way to us, and I’m pretty sure that we won’t be experiencing a mild one in comparison to last year. Staying warm and toasty doesn’t mean you’ve got to crank up the heat (my husband will thank me for that!) or put your long johns on for bedtime stories! I’ve partnered with Sunbeam to share a few tips on staying cozy at home this winter and a chance for one of you to win a heated throw valued at $100! There are only a few weeks in the year where you get to experience the beauty that Fall has to offer. The trees are changing in colour as they are getting ready to shed their layer of leaves in time for Winter. We visited Rouge Park with the hopes to capture the wonderful views but I’d say that we were only partially successful. The park was HUGE and we was pointed to a handful of park entrances that didn’t guide us to exactly the vision of Fall foliage I was looking for! Needless to say, we engaged in a refreshing stroll through the park grounds and breathed in the fresh warm autumn air. We did however manage to find this quiet shaded tree-lined nook and snapped a few photos of my casual look. Accessories are key when it comes to sprucing up any casual outfit and so happy that my friends at BRAVE Leather recommended this double buckle leather belt and shearling bucket bag as the perfect companions. 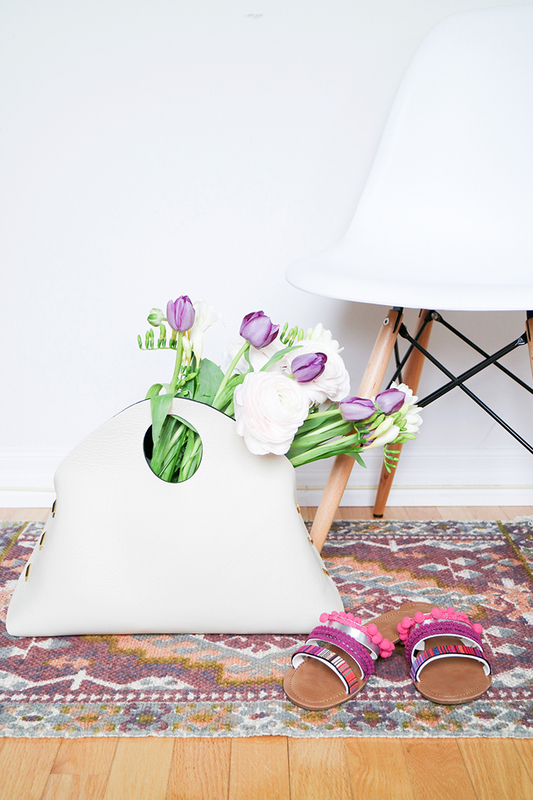 Keep reading for your chance to win a Shearling Bucket Bag of your own c/o of Brave Leather! 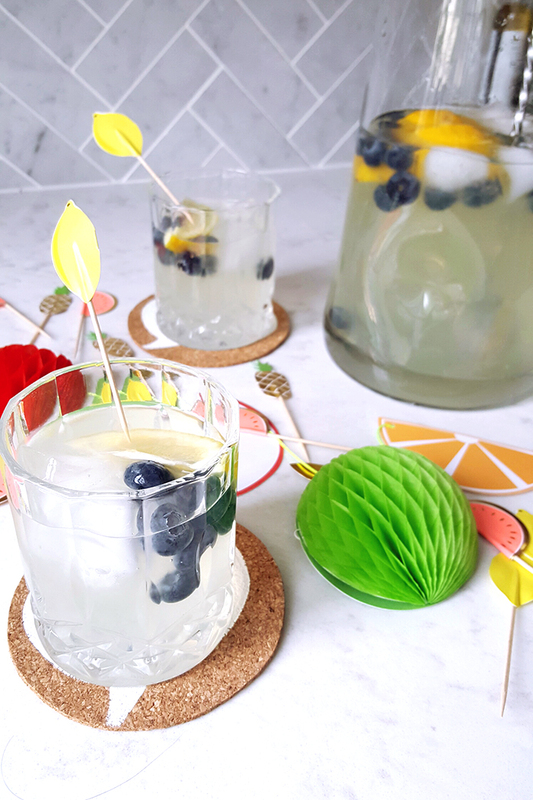 To kick off the Canada Day celebrations (and for my fellow American friends, forth of July), I prepared this simple Coconut Lemonade just in time for the BBQ parties happening over the next couple of days. Natural coconut water is a great alternative to plain H2O not only for hydration but it is said to offer other great benefits such as helping with weight-loss efforts, facilitates digestion, reduces blood pressure, and even promotes healthier skin. I personally love the taste of coconut water, especially from a fresh coconut! But, fresh coconuts are obviously not all that convenient especially in our country, so I opt for the next best option – Thirsty Buddha’s line of Coconut Water products, they are all-natural, gluten free, with zero fat and zero cholesterol. Now, Kyle isn’t all that keen on the natural flavours coconut water offers, therefore, he was actually the inspiration behind this simple beverage recipe. Thanks babe! Read further to see literally HOW easy it is to prepare a Summer Fresh Coconut Lemonade and chance to win a Thirsty Buddha gift pack! Happy Friday friends! Last week, I shared a DIY tutorial on how to customize your own pair of Keds to gear up for the upcoming Summer season. A pair of classic white Keds can be paired with so many different outfits and when you put your own mark on them, they can really transform from an ordinary pair of sneakers to a spectacular addition to your wardrobe! I paired mine with a casual off-the-shoulder dress and some favourite accessories, it was the perfect outfit (and comfortable one!) for a weekend stroll. As many of you know, nothing warms my heart more than to see YOU attempt one of my DIY projects. Read further to enter a contest to win a pair of Keds and Mocs c/o of SoftMoc! I stumbled across this spread of Spring lilacs on a casual stroll last week and couldn’t help but to stop and literally made Kyle snap these photos of me. I can’t believe I spent nearly $30 the other weekend on lilacs (and literally two stems of peonies) at a nearby florist when I could have (but probably shouldn’t) ‘borrow’ some from this yard of lilacs at the park! The beauty of living in the Beaches neighborhood is that we have so many spots to explore on foot. As much as I love a good sandal sometimes they’re just not all that practical when it comes to long walks by the beach (I sound like I’m writing an online dating profile!). I was introduced to the GEOX Nebula line, designed to walk the world. Nebula features technology that ensures lightness and breathability, offering superior body temperature regulation, which means they’re suitable to wear without socks! I chose these multi-colour version instead of a neutral option because they add so much more fun to a casual weekend outfit! I’ve also recently been obsessed with wearing longer length necklaces. I went through a phase of dainty stackables, but now, I’m really into longer lengths with larger pendants! If you like the marble necklace I’m wearing below, keep reading for your chance to win a $60 e-gift card to Shop for Jayu! It’s Easter and that means I’ve got plenty of mini eggs stashed around the house. Instead of stuffing my face with them, these little pastel goodies inspired me to incorporate them in an Easter themed dessert that is sure to impress. 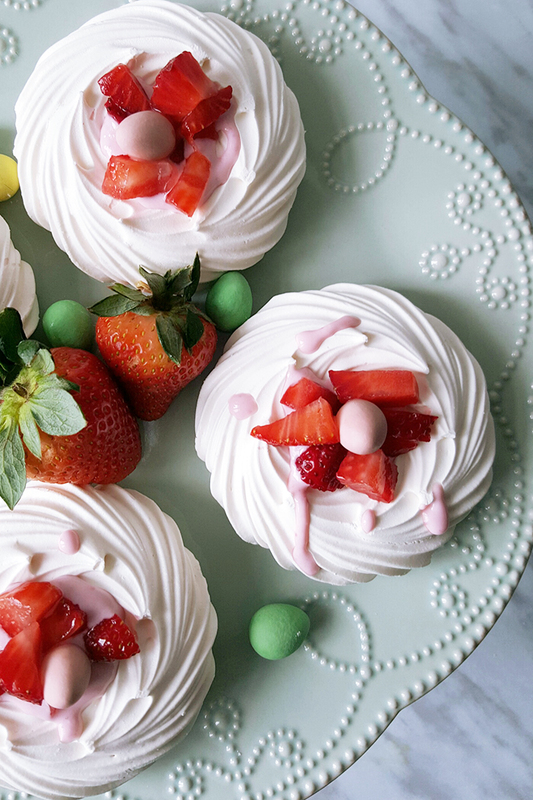 Whether you’re hosting a simple brunch of elaborate dinner this Easter Sunday, greet your family and friends with these extremely simple Easter Meringue Nests! 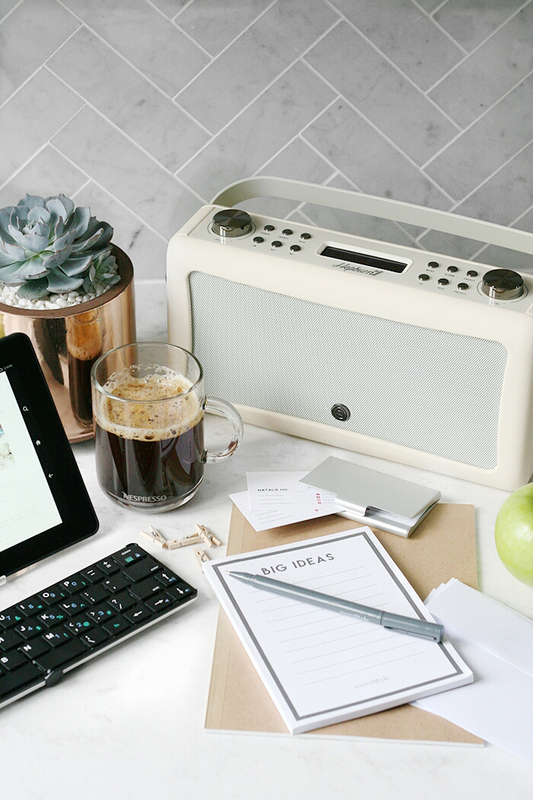 I used some fabulous new PC products from the latest PC Insiders Collection to give me a hand which required no baking/cooking and only a few minutes to prep and assemble. I also used yogurt as the filling for a healthier alternative (bonus!). Read further to learn more about these Easter Meringue Nests and a chance to win $100 PC gift card! Happy Easter! For those of you who are getting ready for Valentine’s Day or still stumped as to what you’re going to gift the special ladies in your life, here are some great last minute Valentine’s gift ideas for you to consider! 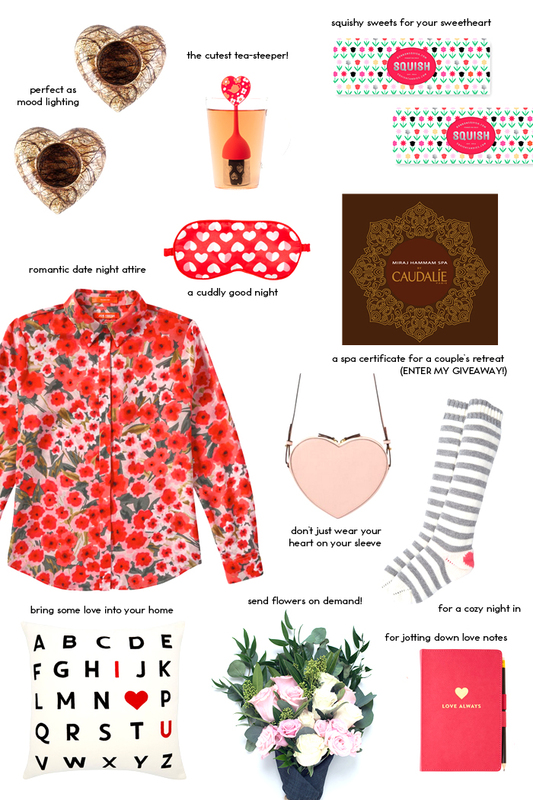 Whether it is sending florals on demand from Tonic Blooms, creating the perfect dinner ambiance with heart shaped candle holders from Artemano or better yet, a Miraj Hammam Spa by Caudalie Gift Certificate is just the perfect last minute gift – I’ve got some great selections below! To show you just how much I love Valentine’s Day, I’m giving away a Hammam and Gommage Spa Treatment c/o of Miraj Hammam Spa by Caudalie valued at $135!